MADE.COM and Desall.com, given their affinities in the way they make design accessible to all, invite all creative talents of the world to take part in the Emerging Talent Award, designing new furniture and home accessories for the MADE.COM catalogue. 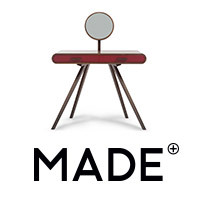 MADE.COM designs, manufactures and sells designer furniture and home accessories online. MADE.COM cuts out the expensive middle men including agents and importers and produce original design at an affordable price connecting consumers directly with the makers. MADE.COM works with more than 40 world-wide established designers and collaborators to create exclusive designs. Its vertically integrated business model also saves time; MADE.COM releases two collections per week, compared with the industry standard of two per year. MADE.COM is now live in the United Kingdom, France, Italy, Netherlands and Germany. The annual Emerging Talent Award sponsored by MADE.COM is aimed at supporting the best new designers. The project winning the contest will be produced and sold on the MADE.COM online store. Get inspired by the MADE.COM style, designing new furniture and home accessories that you feel every home must have, something you can’t live without. Think about your way of living, your emotions and experiences. Product typology: you can design every type of product currently available from the MADE.COM catalogue, including home textiles, lighting, furniture, upholstery, etc. Have a look at the MADE.COM store to see all their products. Where to use: all products must be for indoor home use. - metal sheets requiring moulding process. Style: there are no particular constraints regarding style. You are invited to keep into consideration the target audience of the product as explained below. Target price: in line with the MADE.COM catalogue, based on their approach of making great design accessible. Judging criteria: all projects will be judged on the basis of the present brief and will take into account originality, feasibility, aesthetics, functionality, efficient use of materials (ie: two materials in a product), commerciality and, most of all, compliance with the MADE.COM brand. Participation is free of charge and open to designers and creative talents of any nationality aged 18 years or older. Participants can present one or more projects, but only the projects published on the www.desall.com web site, via the upload page related to “Emerging Talent Award” will be accepted. The selection of the winner by MADE.COM will be the result of an unquestionable evaluation and it will take into account originality, feasibility and consistency with the brief presented. For more information, read the Contest Agreement from the upload page. Do you want to stay updated about "Emerging Talent Award"?